BelindaSelene: Room decor ideas and inspiration! Room decor ideas and inspiration! The first and only time I walked into Hobby Lobby I couldn't leave empty handed. One of my true passions is interior designing. I was looking for a present for my mommie. As soon as I walked through the doors I saw this in a stand with other shiny items and ran to it. Ricardo says that I'm like a cat hee hee, that when I see something either blingy or pink it distracts my attention and go right towards it. She has been wanting a perfume tray for a very long time. It was a perfect size for her too. It was $24.99. They carry different sizes and shapes as well. I think this is a perfect touch for any room because it matches with everything. When I saw this mannequin, I fell in love with it! Specially because it's a damask design! I found her (yes, I think it's a her lol) at Hobby Lobby. I tried to look for a link online but I can't find one. Hopefully you can find her at your local store. It retails for $79.99. I think that's a pretty good price. I want to name her! What should be her name? I think it would be better if you guys decide! 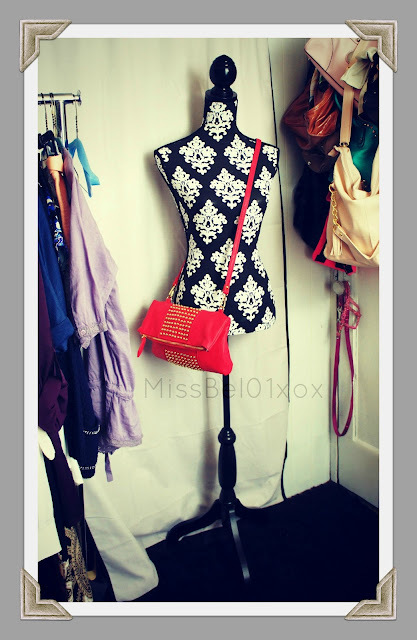 Not only is this mannequin a great accent piece to decorate any girly room, it can also inspire your wardrobe for the season. Add your favorite fashion piece, weather it's a necklace, purse, scarf, and or top/dress to display. Even though I do have a small little room I recreated into my Closet, I still wanted a small inexpensive one in my actual bedroom. This is what I like to call an inspiration rack. I wanted to display and store my favorite pieces of the season. Whenever I store them in my closet they tend to get lost with the rest of my clothes and I forget what I bought. Out of sight out of mind. Since it was going in my room I wanted the the rack to match the theme of my room as much as possible, the colors for example. I didn't want it to look messy or cluttered. 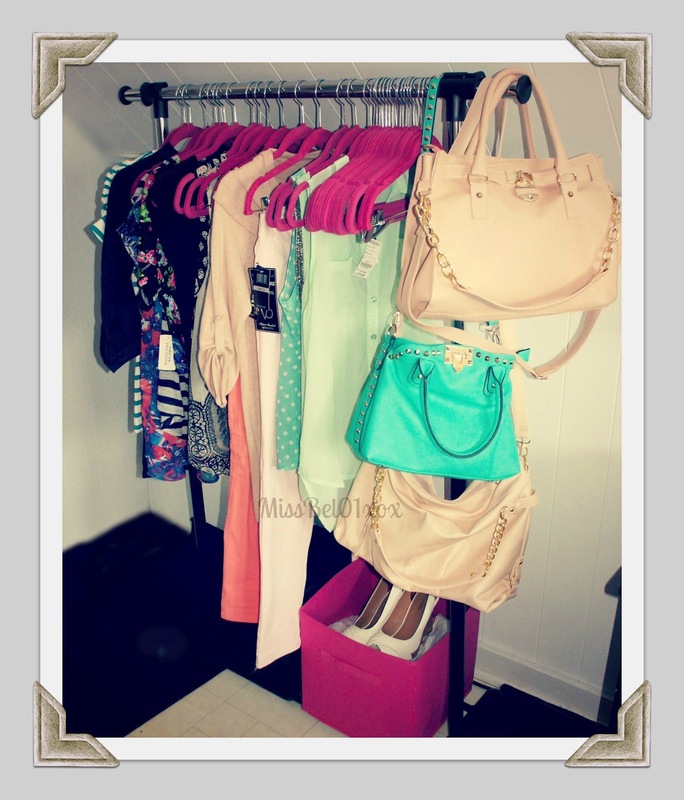 I achieved this by purchasing the rack in black/silver finishes and the hangers in pink! This rack was inspired by two of my favorite YouTube beauty/fashion gurus, Elle Fowler from AllThatGlitters21 and Dulce from DulceCandy87. First I saw Dulce's Fashion Haul video, and I loved how presentable and organized it all looked. I thought this was a great way to store my clothes while in the process of making my next fashion haul videos to share with you beauties. As some of you know before I got this rack I used to store them in a small pink box in the corner of my room. All of the clothes would be wrinkled by the time I had time to show you guys. Once I saw Elle's Fashion Rack Tour video I decided to get it. She showed me that it can not only look pretty, but also give you inspiration in your everyday wardrobe by displaying your favorite fashion pieces. That same week I went out and bought the hangers from Marshalls, the rack from Target, as well as the pink and black cubbies. As you can see I love love love light shades of pinks, nudes, turquoise, and mint greens this spring and summer season. I like to keep my favorites fashion pieces in my inspiration rack as well as anything new I have bought for future fashion haul videos on my YouTube channel. Inside of my pink and black cubbies I store/display shoes that I love at the moment, my current purse, or any new purchases that can't go on a hanger. My accent color is pink (ofcourse!) This pink an white rose vase really stands out against my black wall and black entertainment center. 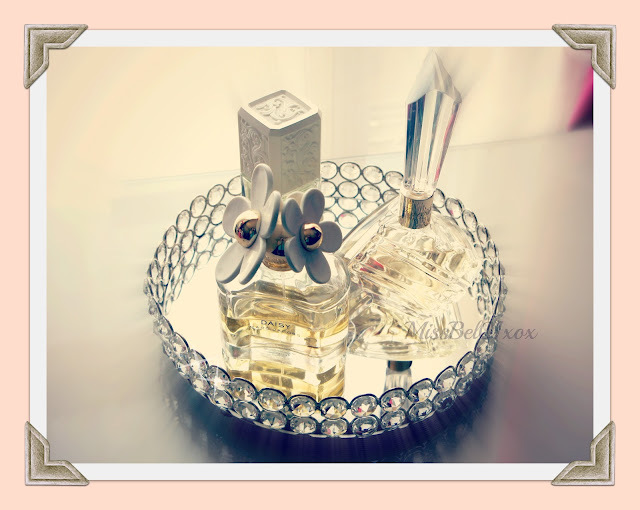 I bought this vase at TJ Maxx for $16.99 (in my Room Decor Haul video I accidentally said Marshalls oops!...). I love it so much! 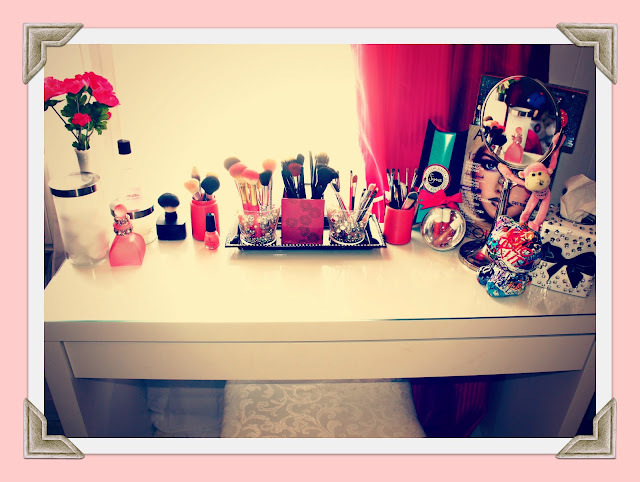 For more inspiration check out my vanity tour! Hey Belinda.. I love your closet idea. I thought it was very neat.. I also love how your purses. And I was wondering what is name of the pink bag on the top? Or where you got it? Thank you.